Mullan Lighting design and manufacture bespoke lighting for the commercial, hospitality, retail and residential sectors. Based in Ireland, we sell to over 55 countries worldwide. Our focus is on product quality, innovative design and flexibility of manufacture. Established in 2009 in Mullan Village, we manufacture our innovative light fixtures inside what was once a flax mill during the 18th and 19th centuries. Later the building would become a shoe mill up until the late 1970’s before lying abandoned for over 25 years. The village has experienced rejuvenation in recent years with many of our lighting engineers, designers and craftspeople now living in the restored mill houses of the picturesque village. The majority of our standard light fixtures can be customised in terms of colour, cable length and size. We also offer a bespoke lighting service whereby we guide the client through the entire process, from initial concept to design, the manufacture of samples, if required, to the finished product. 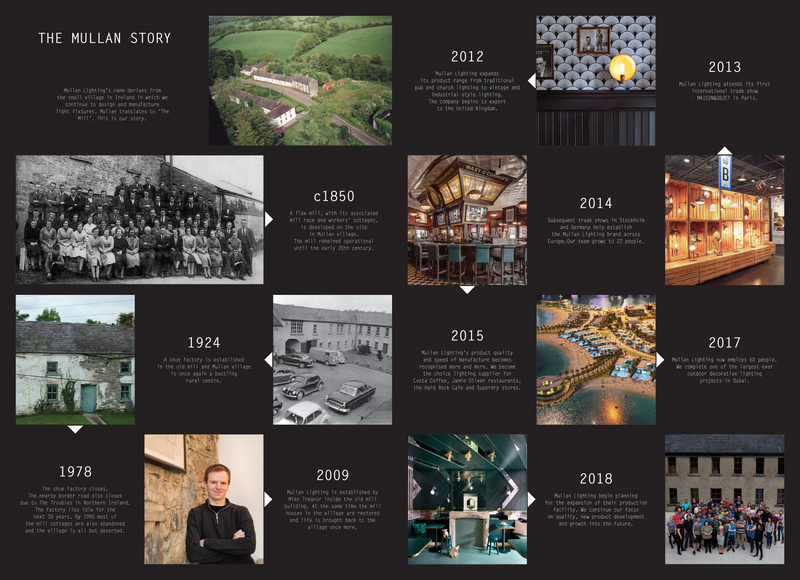 Previous clients include Costa Coffee, Google, Guinness, Hilton Hotels, Jamie’s Italian, LEGOLAND, Radisson Hotels & Resorts, Superdry and Ted Baker, to name a few. We continue to expand our team of designers and craftspeople and our range of light fixtures and designs. Mullan Lighting’s style can be described as a mix of clean lines, along with vintage character and a dash of worldly flair.